Castles intrude upon most of my trips. I don’t plan to visit, but a friend always drags me along. After a handful, they blur together like cathedrals. Not being Catholic, the cathedrals come off to me as beautiful (sometimes), but pompous and slightly shameful. At least with a castle I get a view of the countryside or the city. 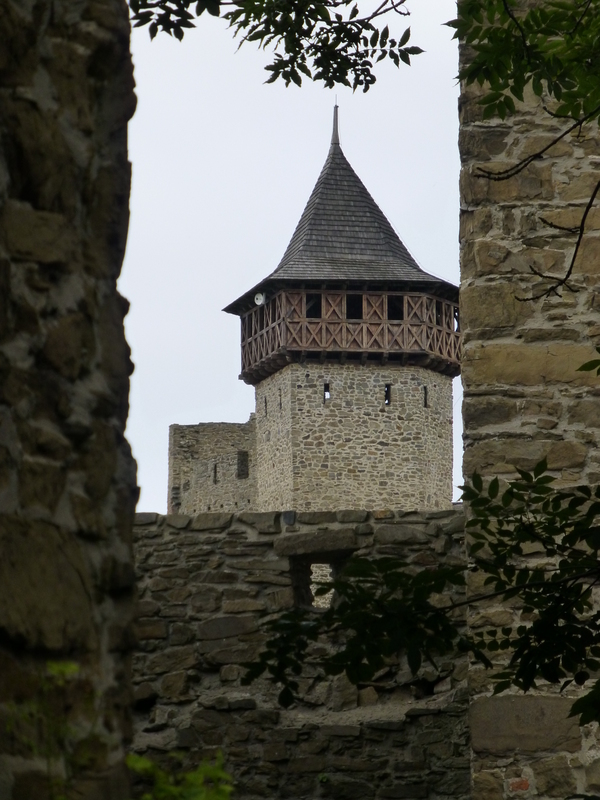 So, at a couple friends’ suggestion, I found myself with them at Helfštýn Castle on a rainy day, 15 km east of Přerov. Most people avoid anything outdoors on a rainy day, but castles tend to be almost as enjoyable (and sometimes better, if rain and fog make the experience spooky) in the rain. The weather keeps people indoors, and the intrepid benefit with the absence of crowds. A 14th-century pile of stone and wood gets a bit more bearable. Never go in an afternoon; castles should be toured upon opening in the morning, or an hour before closing. In the evening, if you’re lucky, fog will take over the area. 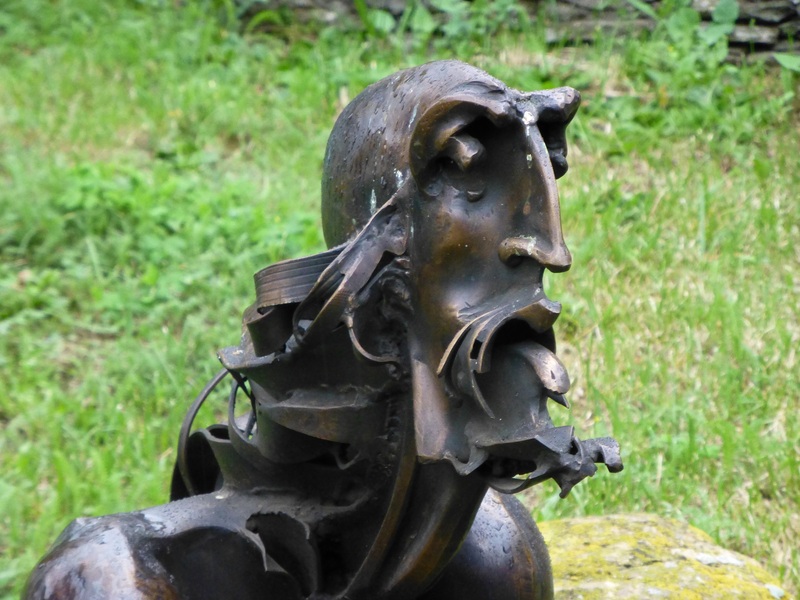 Helfštýn gets used mostly for area history and cultural events surrounding blacksmith art. The art is hit-and-miss, visually speaking, but the skill is impressive. 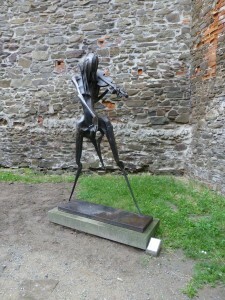 Most sculptures focus on historical figures, but the collection was pretty eclectic. The structure is well-preserved, and isn’t remodeled with grand halls, so it feels more historically fitting, if less impressive. “Paganini” (1998) by Igor Kitzberger and Václav Kitzberger. Detail of Ležící Amos (2008) by Igor Kitzberger, Václav Kitzberger, and Kristián Kitzberger. English signage is sparse, but the ticket desk has English translations available. It’s a notebook of unnecessarily detailed information, but the thoroughness is appreciated. The highlight is the view (otherwise, it’d be sort of useless as a castle, no?). Přerov isn’t picturesque (aside from its square), but it’s a convenient place to stop near Helfštýn and spend an hour or two, especially if you’re visiting as a day trip from Olomouc. Wikipedia has a ridiculous list of castles and chateaux scattered across the country, in case one stop in the area isn’t enough.